If you’re looking for something different to do for a day, or for a way to spend an afternoon passing through the area, Delphi Resort have several options for you to enjoy a day out with friends or family. Why not take a day trip to the resort for a meal out! You can choose from a number of dining experiences all overseen by our multi award winning Executive Head Chef, Stefan Matz. Enjoy a meal from our menu of homemade dishes in the 814 Restaurant while overlooking the scenery of the Mweelrea Mountains or experience contemporary Irish dining with a twist with dinner in The Chef’s Table by Stefan Matz, which features an open kitchen allowing interaction with Stefan while he works to create dishes inspired by local foods. During the day, you can enjoy bar food in the 814 bar or relax with coffees and homemade cakes in the Wild Atlantic Café at the resort. Delphi Spa is the perfect place to take a day trip and relax, unwind and take time to yourself. All of our treatments include complementary access to our Thermal Suite and the Relaxation Room where you can take time to reflect and enjoy these areas while taking in the stunning views, surrounded by mountains, sea and stunning natural beauty.. Specialising in seaweed baths, holistic treatments and organic facials and body wraps, our therapists deliver you the ultimate in Holistic Spa Treatments. Available at Delphi Spa are a number of products for retail from Voya and luxury brand Pevonia – exclusive only for retail in featured spas. 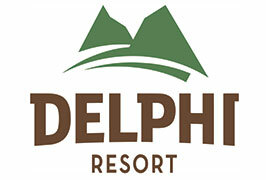 For information on Spa Packages and Special Offers please visit the spa section of our website, www.delphiresort.com. Feel free to enquire with us by phone or email. With up to 20 activities available daily, Delphi Resort has an extensive offering for a family to stop by and enjoy some fun in the outdoors! As Ireland’s leading adventure resort, we offer up to 20 daily water and land activities from as little as €17.50 per child and €25 per adult. There’s something for everyone passing through! Get your pulse racing and adrenaline pumping with this exciting and thrill seeking activity. 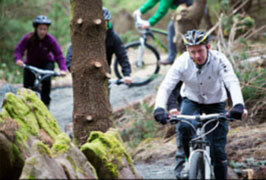 Zip, Climb, Traverse and journey above the trees in this ever popular outdoor activity. 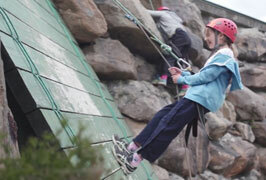 Delphi Resort has several climbing faces to choose from, and grades to suit beginners and seasoned climbers alike. Whatever your level, you’ll be in great hands with our hardy instructors close by giving you the support you need. Gets the adrenaline pumping through your veins with an abseil off the 46ft Delphi towers! There’s a network of just-above-ground wooden tunnels ready for you and your group to explore.. Wade through the ball pool and down a sliding tunnel. Squeeze past the big inflatable ball, and navigate crevices and tunnels up into the tower section. They will let you and your family loose on a trail ride to show off your new skills – including racing downhill! Crank up those gears and brace yourself for this action-packed, adrenaline pumping activity through Delphi Resort’s very own biking trails. It’s fast, it’s fierce, but most of all it’s great fun! Go 20 metres up and take it all in from on the high ropes from the fun-fuelled obstacle course. One of the most popular activities at the resort, you can run and hop through the boggy ground and really push your boundaries in this mud fuelled adventure! If you enjoy target-orientated activities, archery is the ultimate sport for you. Learn how to aim and fire within the safe target range, then put your skills to the test with some great archery games. Delphi Resort is set right by the Bundorragha River near Leenane, within hundreds of acres of Connemara countryside. They will take you on a tour around the Connemara area, through the local rolling scenery and areas of unique natural beauty. Are you ready to take on a Bear Grylls-style challenge? This is as hands-on as it gets! You’ll navigate your journey deep into the rugged Connemara wilderness. You’ll be shown how to build a shelter, light a camp fire, and source food in your surroundings. In this fun and challenging team session, you’ll test your navigational skills deep in the 300-acre Delphi forest park. It’s you, a map, a compass and your wits! Don’t miss the chance to kayak in Connemara, right along the Wild Atlantic Way! Experience Killary Fjord and the stunning views of the coastline and its wild landscape with a kayaking session at Delphi Resort. A kayaking tour is a fantastic introduction to exploring Killary Fjord, one of Ireland’s only and one of the key signature points along Ireland’s Wild Atlantic Way – a truly magical experience. 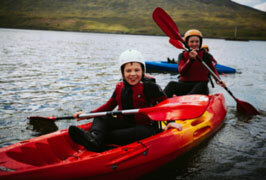 Take an open canoe boat along the beautiful Blueway trail, where the tranquil waters take you through the Killary fjord. Swim, Climb, Jump and make your way through caves for a coasteering experience to remember! Coasteering is a combination of adventure swimming that takes place along the base of sea cliffs, exploring gullies, caves, cracks and different rock formations created by the sea. 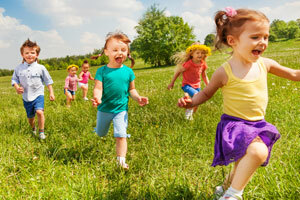 Great for families and groups, this team working activity is sure to bring out your competitive side. It’s pretty straightforward: plan, build and sail your vessel on the majestic Killary fjord. During the session, you head for the shores of the sandy Cross beach, regarded as one of the best surfing beaches in County Mayo. 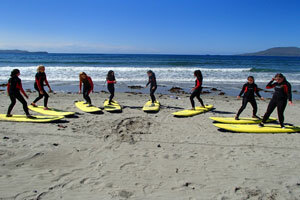 It is the perfect place to experience the thrill of catching waves of the Atlantic. For the younger kids (3-7yrs), who aren’t quite able to tackle the adult activities, our FREE Delphi Dynamos Kids’ Club offers a playtime that will make the day whiz past! In the afternoons we run a Mini-Adventure Club from 2pm – 5pm at a cost of €35 per child – activities include climbing, tunnelling, crab fishing and more. *Runs through peak season and school holiday periods only, limited numbers, booking in advance is advised. Family Fun TIP! You can buy a Family Flexi Pass including a full day of adventure for 2 adults and 2 children at the discounted rate of €288!